New Assembly Time The Laois Association will assemble this year at its usual location on West 48th Street, between Fifth and Sixth Avenues, but at a new time, 3:20pm. We will march after Co. Meath and ahead of Co. Kildare. The later assembly time this year is to more accurately reflect the actual starting time of our unit, thus avoiding long periods of waiting before marching. 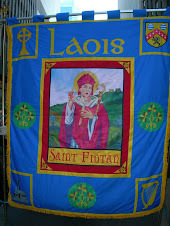 Please see our Laois Blog at www.nylaoisassociation.com, which includes updates and photo galleries from previous years’ parades. We are hoping to develop a regular website in the near future. Congratulations to Vincent Simpson on becoming Laois’s 2015 Grand Marshal. For years, Vincent marched up Fifth Avenue with his mother, Peggy Drennan, who emigrated from Oldtown, Cullohill, Co. Laois. Peggy inspired Vincent’s longtime love of traditional Irish music and dance, which explains his frequent attendance at Irish ceilis. The oldest of seven children, Vincent developed a deep appreciation for his Irish heritage and culture and says he proudly marches on St. Patrick’s Day with the spirit of his mom and all those who went before him. Up Laois! Pursuing his Laois heritage, Vincent has taken his daughter, Aisling, to visit Ireland and his mom's farm in Oldtown. He still cherishes the fond memories of his mom’s last trip to New York in 2007. Vincent is currently an operating engineer in Times Square, and his three brothers are active or retired members of the New York City Fire Department. We are proud that Vincent will lead us up Fifth Avenue on St. Patrick’s Day. We are pleased that the Parade Committee has taken the first step this year in moving forward to resolve the ongoing controversy over inclusion and getting everyone on board. As usual, the Parade Committee has strongly urged each organization to adhere to the following dress code: “Sunday best” dress. “No sneakers, jeans or inappropriate attire.” The Committee would appreciate our cooperation. with our Laois Association a number of years ago when he was a TD for Laois. Our association posted congratulatory notices to him in both the Leinster Express and the Nationalist on the occasion of his appointment. Our senior Laois Association member, Bill McEvoy, Comhaltas Ceoltóirí Éireann founder in the US and Canada, and his wife Lily celebrated their 65th wedding anniversary in February with Bill playing in his own band at the reception. Congratulations to Lily and Bill! Bill, at 92 and possibly the oldest man marching in the parade, says he will join us once again on Fifth Avenue this year. He enjoys writing, playing in his band, traveling and, of course, his nine children, 25 grandchildren and nine great-grandchildren. www.tomphelan.net and www.facebook.com/tomphelannovels. Tom’s wife, Patricia Phelan, who is marching with Laois again this year, is serving aseditor of the award-winning Newsletter of the Irish Family History Forum (www.ifhf.org) and works as a professional genealogist specializing in Irish and U.S. family research. She can be contacted at glanvil3@aol.com. Please send us your email address to facilitate faster correspondence.